Todd and Jordan Champagne began happy girl kitchen co. out of the sheer love of food. After working on farms for years and preserving the glut of our california seasons, Todd and Jordan have been lauded as key members in the thriving food community of the central coast. 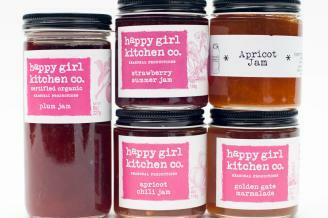 happy girl kitchen co. is dedicated to simple, delicious and farm driven foods. Enriching community and showcasing the unparalleled talent of local farmers are central to the happy girl mission. By hosting parties, recipe swaps, pop-up dinners and workshops, happy girl kitchen co. empowers people to get involved and learn about the importance of what's on their plate. Flash Your Badge and receive FREE coffee or tea!